Are you involved in promoting the Lynton & Barnstaple Railway? If you are part of a local group, have a sales stand, or if you have a model layout connected with the L&B that you exhibit at exhibitions or events, then we’d like to hear from you. 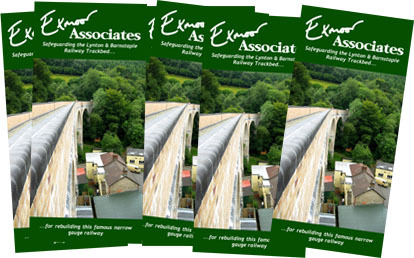 When we first set up Exmoor Associates, we printed a fairly large quantity of leaflets outlining what we are about. Over the last few years we have used up most of these, however we still have a few hundred left. If you have a Lynton & Barnstaple Railway layout or stand that does the events or exhibitions circuit, please let us know if you would like some leaflets. We would like to use up the stocks that we have left, and what better way than to spread the word through the various support groups and the events they attend. Please get in contact with us if you would like to be sent a batch. we would take leaflets both for our County gate Model and our Bratton Fleming.